Behind the old Customs House, a bouquet of 35 copper pipes of various sizes is planted in the ground, looking like birthday candles. Each represents one decade. In front of this bouquet, three large rectangular plates feature inscriptions about the history of Montreal. The first one features a quote by François Dollier de Casson, Superior of the Order of the Sulpicians, from the work L'Histoire du Montréal, published in 1672. On the central plate, specimens of the signatures of Native Chiefs who signed the Traité de la Grande Paix de Montréal on August 4, 1701, are engraved. The last plate features a quote by A.J. Broy and John Lesperance, from Picturesque Canada, published in 1882. The last piece of this installation is a narrow strip of glass that crosses the plaza from one end to the other. It serves as a skylight for the museum's crypt. 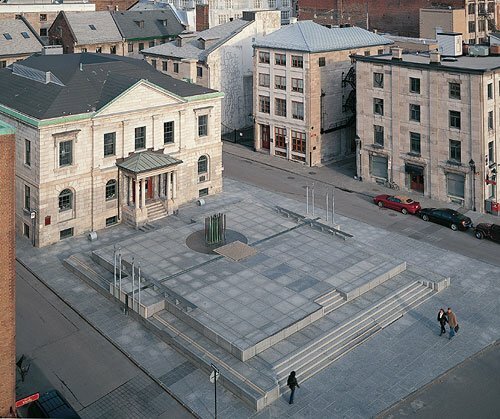 This line includes two inscriptions: "1642", Montreal's year of foundation, and "1992", year of the 350th anniversary of its foundation. All components of the artwork described above are there to recall the history of Montreal and mark the anniversary of its foundation. Also, the 35 copper pipes seem to burst out of the concrete slabs as a fountain, evoking the presence of an older fountain, the remains of which are stored in the museum's crypt. Lastly, the three plates seem to be arranged in the shape of a cross, perhaps as a reminder of Maisonneuve's first cross.